In recent years, we have seen a massive shift in consumer trends. The creation of personal electronic devices has revolutionized the market and caused consumer electronics to rise to the top of this year's Holiday wish list. This Holiday season, the Consumer Electronics Association (CEA) estimated that spending on consumer electronics will reach historic heights, despite a decline in overall gift spending. This is due in part to revolutionary advances being made in technology and the trend of ever falling prices. As a whole, we are becoming more sophisticated and increases in efficiency and production are making it possible for these Electronic Devices to be manufactured and distributed at an affordable price. The cost of In-Home Entertainment Electronics has dropped severely over the last decade. The price of LCD and plasma TVs has been falling by thirty percent a year and are now a common addition to a household's living room. Other contributors to the growth of consumer electronics has been Laptops, Netbooks, Mp3 players, Smartphone's, iPods, Tablets and many more. The drivers of growth for these devices are personalization, mobility and connectivity. Fifteen years ago, being mobile meant carrying around a ten pound radio and a cell phone the size of a brick. These devices have gradually become small enough to fit in ones palm and more advanced than ever imagined. 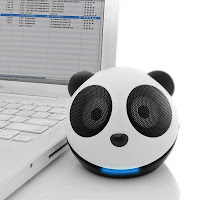 Portable Audio speakers such as the Panda Pal are one example of how mobile technology has really become. This device ways less than a pound and can fill a room full of crisp music. Smartphone's and iPods are the drivers for these portable speaker devices and have led to the creation of new fields of consumer electronics. Smartphone's enable people to be connected to the internet and their personal information at all times. This mix between personalization, mobility and connectivity has fueled the need to develop new technologies. Smartphone's and the majority of mobile devices run off lithium batteries and need to be charged daily. They have become a part of our society and are practically a necessity for daily life. The GOgroove Go-Charge is one example of how technology has been adapted to accommodate these new developments. It allows the user to remain connected to their mobile device by providing power in any necessary situation. It can provide power to these mobile devices Via AC, DC or with its built in 1500 Mah battery. Other devices such as Fm Transmitters go hand-in-hand with these mobile devices and eliminate the need for CD's in automobiles. As technology advances, so do the accessories that go along with it. These advances have led to more complex and affordable electronics for the average consumer. You can expect Accessory Genie to stay on top of these developments and continue to produce accessories for the most popular consumer electronics.